The weather was clear and a seasonable 43 degrees on 12-13 April, the night in 1879 when UFO ‘Mothership’ as they have come to be called, was seen over New York City. Harrison’s sighting was looked upon with with suspicion and derision from most of his peers. 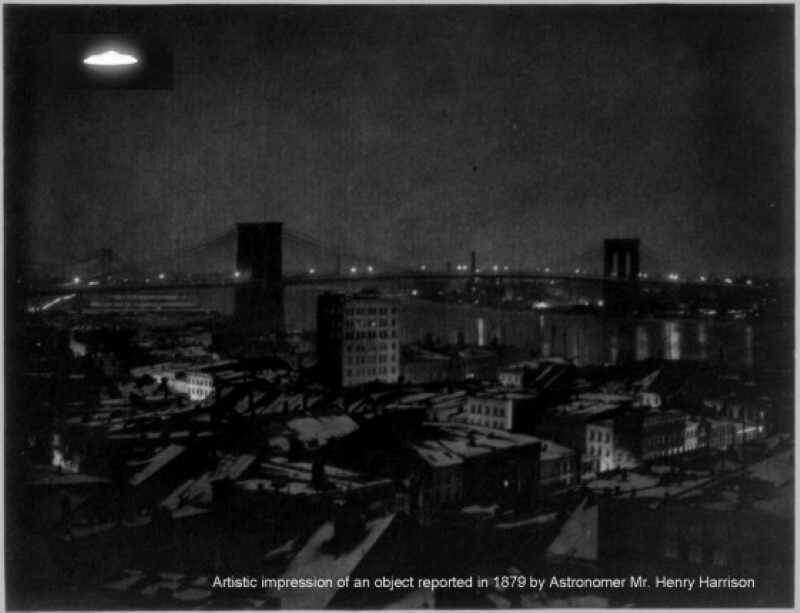 The glowing circular shaped object was observed by Jersey City, NJ Astronomer Mr. Henry Harrison. The object gave the appearance of hovering at a very high altitude but Harrison realized that an object would have to be moving at great speed in order to remain overhead as the Earth turned. Needless to say this mystified Harrison as he made his remarkable observations because, like it or not, the object was generally *stationary even as the stars rose and set behind it. He watched the object for the better part of three hours when suddenly it sharply changed its direction and began flying eastward. Harrison made additional observations later that night and quickly ruled out the Brorsen’s comet because the object simply wasn’t there any longer; a comet would have been. Henry was a member in good standing with the Toronto Astronomical Society and realized that he needed to report his findings with an established scientific authority. The next day he sent a telegram to the US Naval Observatory in Washington, DC. His telegram was discarded by the director, world famous astronomer Asaph Hall III. Upset with getting no response from an esteemed astronomical authority, Harrison wrote a letter to the editor of the New York Tribune. The newspaper published the letter on “A Curious Phenomenon” 17 April 1879. The contents of Harrison’s newspaper letter concerning his observations were also later published in the May 10th, 1879 edition of Scientific American (Vol 40 Issue 19). Harrison afterwards was swamped with letters from other astronomers and most certainly he caught his share of denigration from his critics about his supposed “sloppy scientific reporting” of the observation. The critics asserted that he probably just saw Brorsen’s comet. But the rather militant Harrison knew that Brorsen’s comet would only move about a degree a day in the sky. Whereas, his object was moving at a rate of two minutes of Right Ascension per minute, a huge amount, a comet just wouldn’t be doing that. Henry Harrison would ultimately get some peer validation from two New York regional astronomers; Mr. J. Spencer Devoe in Manhattanville and Mr. Henry M. Parkhurst. Devoe published a letter confirming his observation of the object the same night Harrison did and published his measurements at the urging of Parkhurst. Harrison described his object as circular and bell shaped and clearly moving under intelligent control. Later, Morris K. Jessup, using a combination of measurements from the three regional astronomers, calculated that the object was over New York City for three hours. He further determined that the object was at an altitude of 80 to 100 miles above the Earth and estimated the bell shaped object to be about a half mile in diameter. [Editor’s response: I don’t normally make it a habit of including UFO reports in the mainstream news pages but in this case I wanted to make an exception…simply because of the date of this sighting and the occupation of the reporting witness. 10 February 2014: at about 7:30 p.m. a Patchogue man and his family observed a very bright object appear to be going into orbit around the moon. They did their observations using the family binoculars. 15 February 2014: at about 2:40 a.m. a Mahopac man went outside to get something from his car. While outside he heard a buzz or humming sound sort like an industrial electrical transformer. He observed a large oval shaped object that blocked the moon light and cast a shadow on the clouds. As the object passed over his house the sound peaked and the air around him seemed to get warmer. He says that object emitted no light of its own. 15 February 2014: at about midnight, five Manhattan residents while walking up 160th St. in Washington Heights observed a bright glowing object silently flying over the local buildings. At one point the object stopped and seemed to hover over a building, and then it ascended rapidly until it disappeared. The observers report a sense of awe. 17 February 2014: at about 8:15 p.m. a Schenectady resident observed small bright blinking yellow lights all over in sky. Then suddenly a much larger bright object showed up and began hovering. The smaller yellow blinking lights began flying around the larger object and occasionally winking out and winking in again. After a short while the larger object with its posse of smaller lights silently flew out of view. 18 February 2014: at about 6:30 p.m. a Wilton resident was doing some outside chores and witnessed, “It looked like it was kind of rocket shape with metal arms coming off the sides.” He states that he ran around the side of the house to get a better look but it was gone.